Over the past five years SSARG have been investigating this site to discover more about a Roman building discovered in 2013. 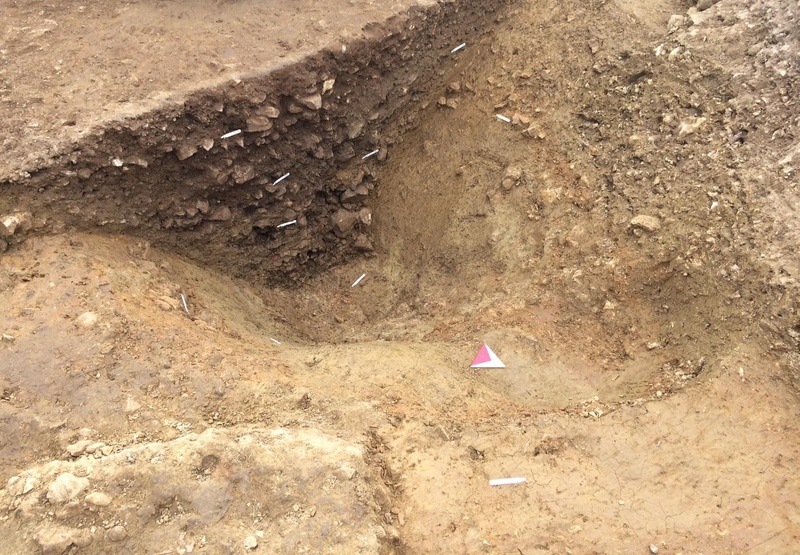 A series of test pits in 2014 targeted anomalies detected by geophysics, one of which uncovered a Roman grain dryer which was later excavated in 2017. In 2016 we uncovered a Roman midden and collapsed building. This year the focus of the work will be more geophysics leading to a small series of test pits. Excavated Roman grain dryer dating to the late 2nd/early 3rd century. SSARG along with the Penselwood Local History Group have recently carried out geophysics followed by test pitting in a field that includes some of the the mysterious "Pen Pits". These are a series of collapsed pits (possibly quern quarries) covering an area of nearly 300 hectares. The test pits were located on geophysical linear anomalies and uncovered Iron Age and Roman ditches. Section through Middle Iron Age ditch. SSARG have recently carried out a gradiometer survey over an artefact scatter in a field near Wincanton. The results suggest a significant multi-phase site. We will be carrying out a resistivity survey with a view to test pitting later in the year.